I decided that, given how motivated the students were, we should launch a friendly competition to encourage them to set and meet goals during the summer months. 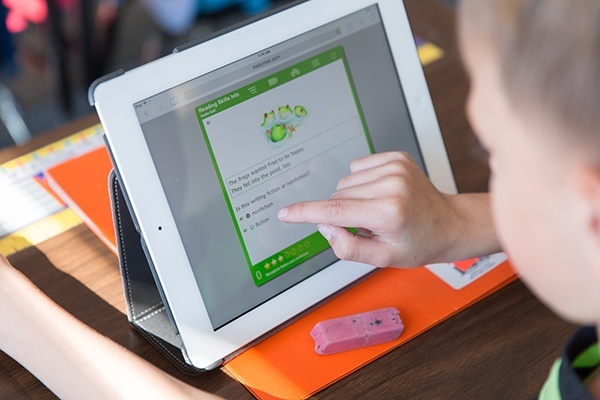 We used our learning platform, MobyMax, to set up a contest that encouraged kids to compete against each other (as well as themselves) to successfully solve math problems while on break. You’d think the kids would have preferred to go swimming or play video games. But in fact, 156 students joined in the fun during June, July, and August. Seventy-five of these students worked particularly on fact fluency and ended up answering 36,408 problems correctly – an astounding number. Moreover, participating students passed 2,740 math standards, along with 725 language standards, and 227 science standards. Such achievement any time is noteworthy, but over the summer? During vacation? Wow! Many of the summer students accomplished more than just completing problems. They showed real growth in subject mastery. In fact, 37 students gained 1 month of grade level improvement, 5 students showed a 3 month grade-level gain, and 2 students gained 9 months, essentially moving them into the next academic year. When we showed the parents that some students had experienced 2 or 3 months of growth over the summer, it was like…mic drop! We acknowledged the students’ achievement and success by assigning them more advanced skills to work on. This keeps them involved and motivated, a process we could do thanks to the flexibility of the edtech software we’re using. We’ve also developed a year-long plan with exciting quarterly contests in Fact Fluency and Science. We’ll be staging a large fall math contest and a spring language contest. We’ve instituted a new 100% club that encourages students to master 100 percent of all math standards in their grade. At the end of each contest, we’ll acknowledge all participants and reward those who exceeded expectations. Our school-site acknowledgment ranges from field days and awards ceremonies to 100% club parties. At these events, attendees are treated to pizza and dance-offs to celebrate their mastery of the state math standards in their grade level. The recognition doesn’t end with school-wide celebrations. In some classrooms, teachers have even built theater-style stages to recognize their student stars! Others have created centers that allow for personalized learning and themed bulletin boards tracking classroom progress and encouraging healthy competition. We believe very much in “sharing the wealth” when it comes to keeping all the teachers on staff informed about any techniques and solutions that increase student success. To that end, we’ve developed a MobyMax 101 training for just our school. This training helps teachers put contests, competitions, and software solutions to work for their students, whether they’re gifted and talented or not. There are a few of us who love to find tools that give you the extra edge in the classroom. The ease of use is key, and it can’t be rocket science. In this case, with this software, you only need to spend a couple days playing around, and you can easily figure it out, as our training will show. We’ve also set up a grade level committee of “super users” to be the go-to resource for each grade. We’ll be offering supplemental training and support throughout the year. After all my years of teaching, I feel like I may have finally cracked the code on what it takes to motivate and engage gifted and talented students. It’s great to be starting the new year with a proven game plan in place! Christopher Godshall is a third- and fourth-grade AGP teacher at McKitrick Elementary School in Lutz, FL. - EdTech Digest published the original article here.